While the media attention is directed to the refugee crisis in Germany, France’s highways in Normandy are descending into complete chaos and lawlessness. France’s rule of law has ceased to exists in the area around Calais. In Europe highways used to be inaccessible to pedestrian traffic. 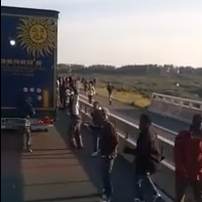 Nowadays in France immigrants are wandering on the highways, and trucks are being stormed, which has become the “new normal”. As the events are unfolding in France, European mainstream media are ignoring them. Calais has had a migrant problem for more than 10 years, but since last year the situation has been deteriorating rapidly. The governments in Paris, London and Brussels have completely lost control, they are not able to maintain the rule of law and they are miserably failing to protect their citizens. European and especially English politicians have tried to solve the problem by punishing the victims. European truckers, already at the bottom of the earning pyramid, can be fined up to half of their annual salary when refugees manage to get aboard their trucks. “In one case, a lorry driver was issued with a £19,500 fine, despite calling police when he discovered around a dozen people inside his trailer while driving on the M25. The situation on the highways in Normandy, France, December 2015 and January 2016.